Is this 98-year-old the world’s oldest bartender? A 98-year-old bartender working in Bridgeport, Connecticut, may be the world’s oldest and longest-serving bartender. Angie MacLean began bartending at the age of 17 to supplement her income earned working at General Electric. Born in 1915, MacLean is still working full-time as a bartender at Panama Joe’s Café in Bridgeport, pouring drinks for eight hours a day, six days a week. 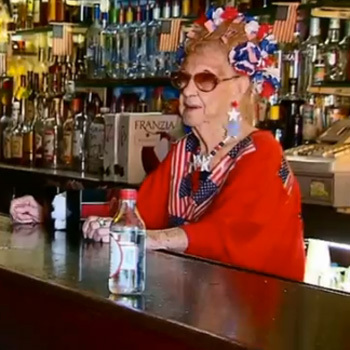 The geriatric bartender claims she’ll continue bartending for “as long as (she) lives,” and still makes the effort to dress up in patriotic attire for every US holiday. While MacLean has been serving drinks for 81 years, the official Guinness World Record for the longest career as a bartender belongs to Clarice J. Kramer Cadarette Grenkowicz (born in 1919), who has served at the Maplewood Tavern in Alpena, Michigan for 71 years – her entire career as a bartender.